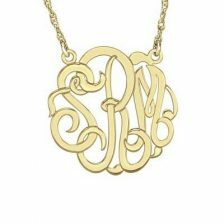 Hand cut 3 initial script monogram pendant on your choice of a 16" or 18" rope chain. Available in Sterling Silver or 22k Gold over Sterling Silver in your choice of 4 sizes. 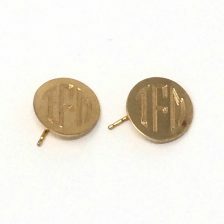 Personalized round post earrings measuring 5/8' x 5/8" with a post. 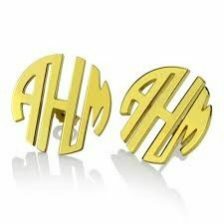 Available in Sterling Silver or 22K Yellow Gold over Sterling Silver in either block or script lettering. 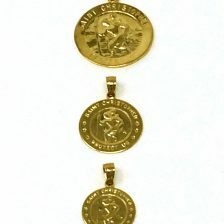 This 14K Yellow Gold St. Christopher Medallion reads St. Christopher "Protect Us" on the front, and features a plain back which can be engraved and is available in three different sizes. For information and cost for custom engraving, please call us @ 484-432-2179. Hand cut 3 initial post earrings measuring approximately 1/2"x 1/2". Available in Sterling Silver or 22k Gold over Sterling Silver. 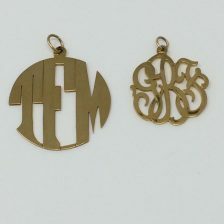 Hand cut three initial Script or Block Monogram pendant designed with a center loop on your choice of 16" or 18" chain. 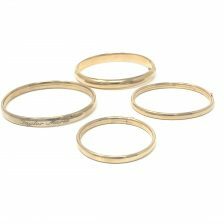 Available in Sterling Silver and 22K Gold over Sterling Silver in your choice of four sizes. 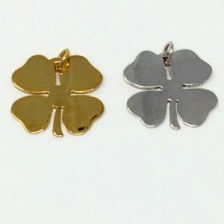 This beautiful clover charm which measures 1 3/8" is available in Sterling Silver and in 22K Yellow Gold over Sterling Silver and is the perfect compliment to one of our chains or keyrings. 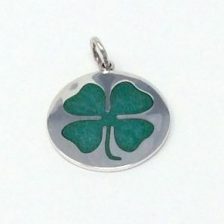 Sterling Silver 1 1/8" charm bearing a Kelly green enamel clover. 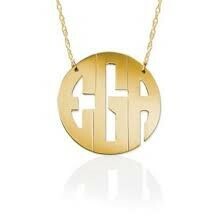 The beautiful enamel St. Christopher collection is now available with school logos. 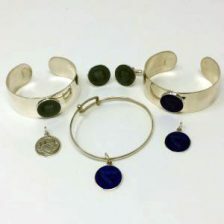 We are offering Sterling Silver cufflinks, charms and bracelets all with an enamel 3/4" (size of a nickel) school logo in your choice of the 22 enamel colors or in plain Sterling Silver. We are able to set up any school logo, but please note with all new set ups there is a 12 piece minimum order. Please contact us directly for more information. 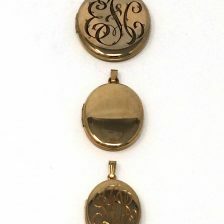 Hand engraved monogram locket on your choice of 30", 36" or 40" rope chain. 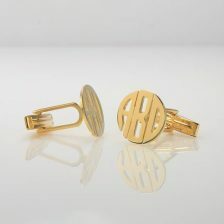 Available in Sterling Silver or 14K Gold Filled in your choice of three sizes engraved in either script or block font. To customize the back please contact me directly.